This is a pretty easy project, but it's a fun way to personalize your own notebook, pencil case, and little pouches. I used a regular old composition notebook, that way, when your book is full you can just add in another one and start up where you left off! My aunt made me a sketchbook cover similar to this as a kid and it was fun to have the same cover and be able to replace the book once it got filled up. The directions for the mini pouches are easy. Cut fabric strips of both the lining and outside the width you want the pouch to be (plus seam allowance) and then make them twice the height you want plus a flap (and seam allowance again). Pin then right sides together and put a loop of elastic on the inside, pinching it inbetween the seam and then sew all around the outside, leaving a small hole to turn through. Turn and press. 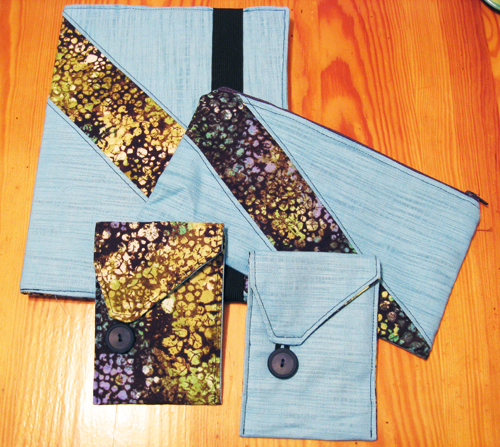 Then fold up the bottom edge to make the pouch and sew all the way around, sew on a button, and done! For the pencil case, use this super dooper tutorial at Skip to my Lou. For the book cover you're going to need to measure the dimensions of your book, the full width (that means both front and back cover and spine) and height. Add seam allowance to this plus like 1/8 inch for ease of movement, trust me, you want this snug but not impossible to slip the book into! Also measure how deep you want the interior flaps to go on the inside of the covers, the longer this is the more securely it will stay on your book. Now cut the full dimensions of your cover out of lining and outside, the flaps out of the outside material, and elastic slightly less than the height of your book. Then sandwich the pieces together so that the lining and cover are right sides together and the flaps are inside the sandwich with their right sides facing the cover. The elastic needs to go between one of the flaps and the cover. Pin together and sew around the outside, leaving a hole to turn through, and press. Then you can top stitch all the way round really close to the edge (it will get tricky around the elastic part but just stretch it out of the way if you need to). Then slide your notebook into it! I drew up an illustrated instruction sheet for this project but I lost it somewhere! If I find it I will post that up here to make the instructions clearer!